EaseSuite is our all-in-one integrated software platform aimed at the industrial/services industry including engineering, construction and hire companies. It offers a feature-rich yet easy-to-use package of up to 7 pick & choose modules including: Stock Control, Purchasing, Sales, Equipment Hire/Plant, Asset Management, Job Management and Staff Planning in a modern Windows Desktop application, with many customisations available. Optional Sage Line 50 integration is available. Each area of the application integrates seamlessly to share common information, with most elements combining to make a job (a unit of work). Powerful search & recall, tagging & status tracking and integrating staff workflows helps increase organisation and efficiency throughout busy businesses. To strive towards meticulously accurate stock & staff planning, tracking and billing in the simplest way possible. At the core of the package are jobs, essentially units of work carried out for customers. All other elements including purchasing, sales, hire, time-sheets, affected assets can be associated with a job. 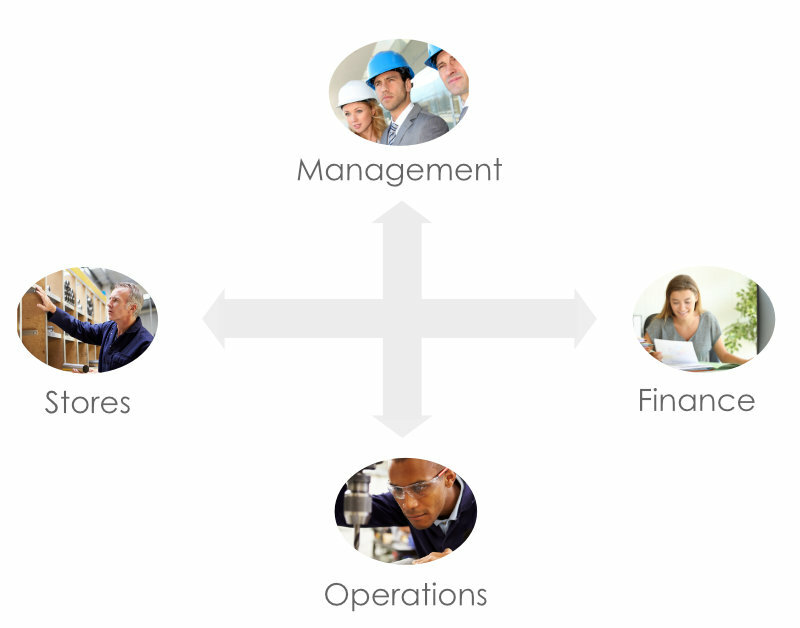 Jobs contain a detailed history of events, costs, staff involvement and profit. 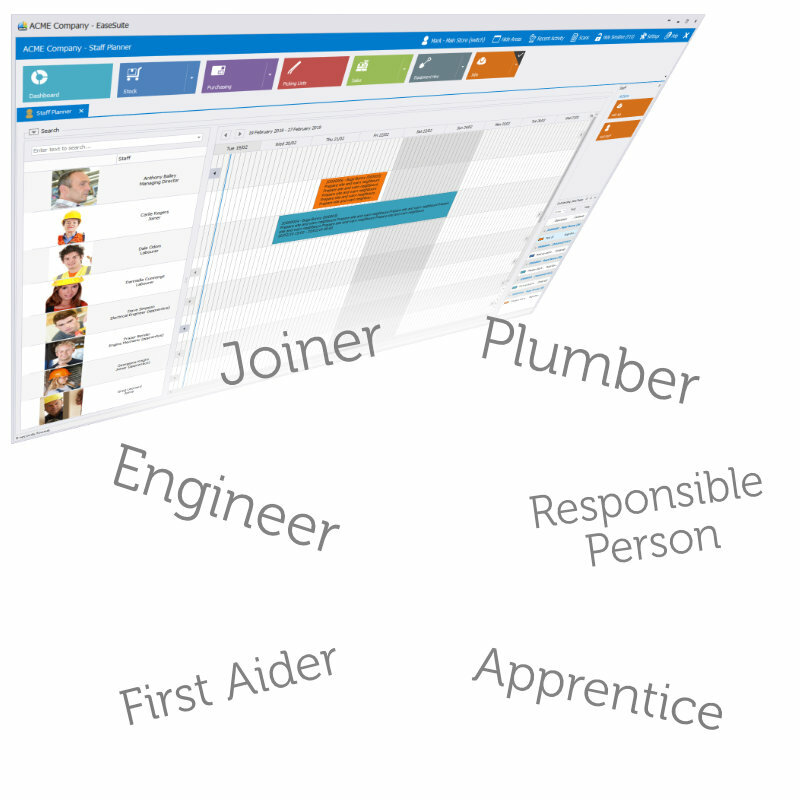 Templates can be set up detailing the tasks and the trades/roles and individual timings required to complete tasks for use when scheduling to find suitable staff available. They can be short or long running, and part billed over time. 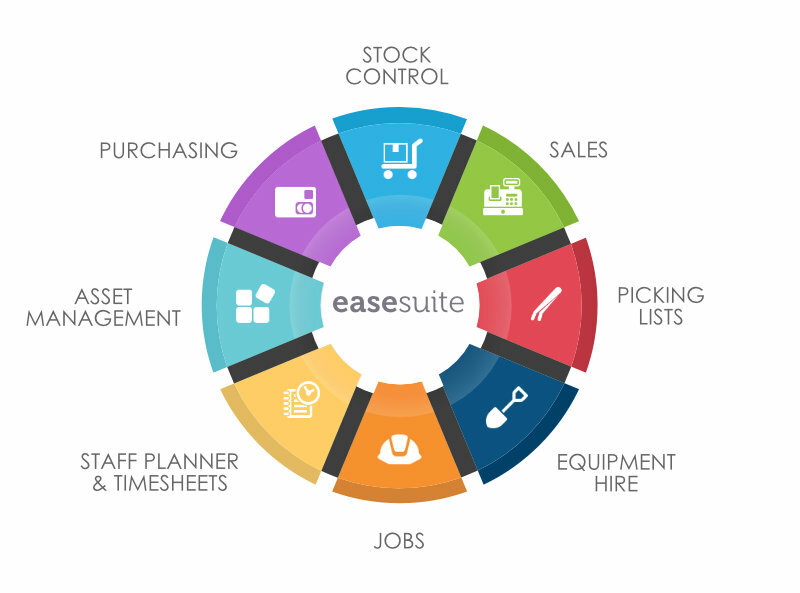 Whether you plan work daily or longer term, EaseSuite allows work plans to be easily set out for staff members by dragging jobs next to them, with plans re-arrangeable should priorities change. Staff have associated trades and attributes to ensure they meet the requirements of job, allowing staff of all levels to deal with allocation effectively. Time tracking/labour billing can be especially difficult in a busy business and usually involves staff constantly being chased to provide time spent. EaseSuite has a number of features to ensure lost time is elimated and all billable hours are accounted for. It is capable of recording all time including billable, non-billable/internal, holiday & sickness, along with overtime and doubletime (and other rates). The staff planner also assists this process by showing where someone was planned to be. Once weekly hours are correct for all staff, labour time is then priced automatically (overridable) and included on a job for onward billing. Coming soon is a mobile application for iOS/Android that allows staff to see their work plan and submit timesheets on the go (or when they get home), with appropriate reminders. This time is then approved by admin staff for onward billing. Powerful stock control that contains all the standard features you'd expect including quantity tracking, reorder thresholds & amounts, categorisation and coding, stock taking and more. 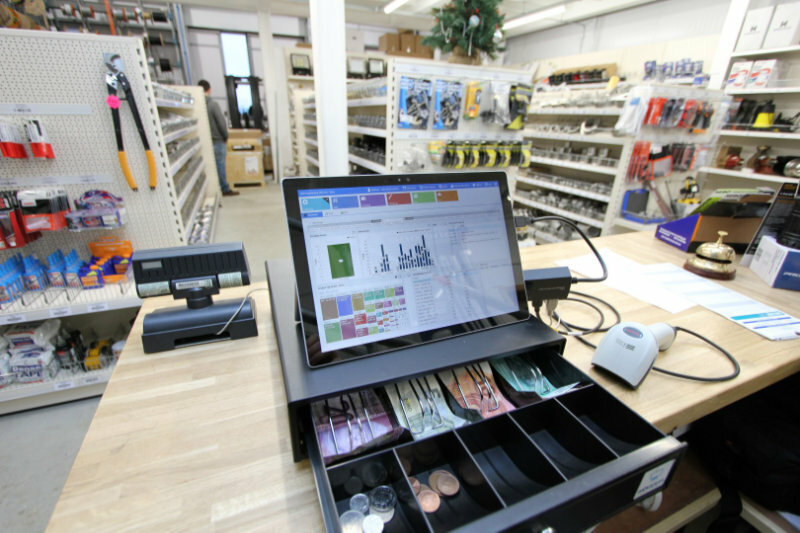 A number of convenience tools make it highly flexible and quick-to-use, such as markup rules for bulk price changes, extensive search features, portable tablet support for walk-around stock taking/cataloguing/photographing, and an online image search built-in to name a few. The stock module closely integrates with purchasing and sales orders modules. 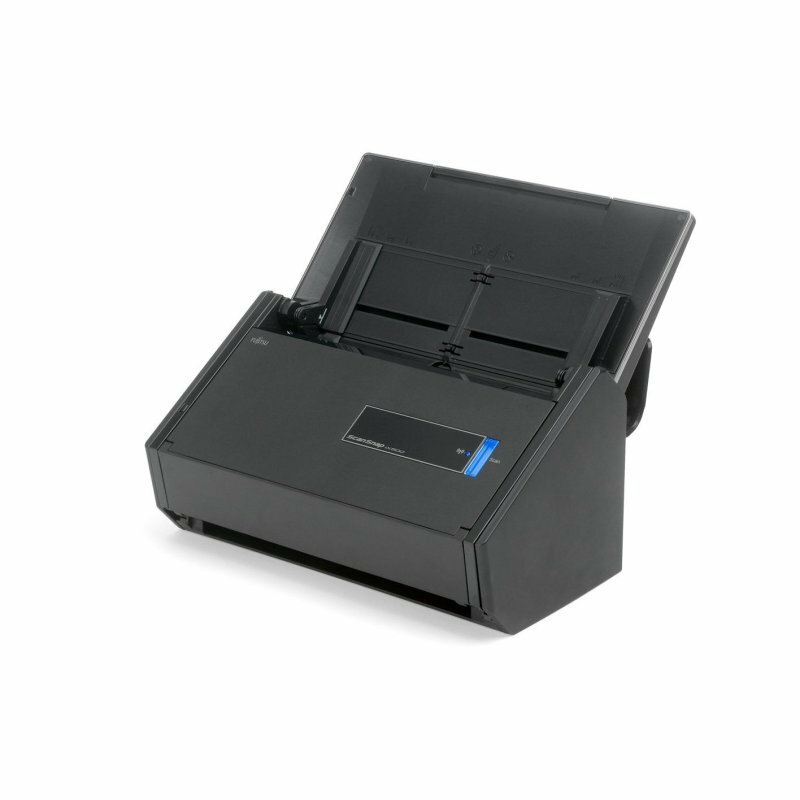 Sales counter/order creation with the common features including barcode scanning of items to build up orders, Ingenico card machine integration for receiving payments, customer till display, cash drawer opening and receipt printing. Bill at time of purchase or generate sales orders and later invoice for on-account sales. Refund goods. Search the stock list to find related items or alternative options. The tablet can even be used to walk-around with customers and build up orders. Purchasing can often be eventful, long running and involve different departments with supplier chasing, drips & drabs arrivals, fulfilling customer reservations/jobs as items come in (including onward billing), payment tracking and checking off arrivals. All this requires constant attention but it is easy to miss things in a busy business as the orders grow and stock inventories change. The purchasing module fortunately offers a number of well-thought-out features to deal with these logistics and to proactively help staff keep on top at all times so nothing gets missed. Simple to use plant/equipment hire with visual availability calendars for making bookings and detailed price/discount scales to automatically price by duration. Close integration with sales to generated sales orders and receipts, or assign to an ongoing job for later billing. Take care of fleets of vehicles, hire equipment and onsite customer equipment you maintain and install under contract, from purchase through to decommission and replacement. A fully tracked history of events identifies its life cycle, including all servicing/testing, maintenance jobs involving the asset, and the chain of replacement over time. 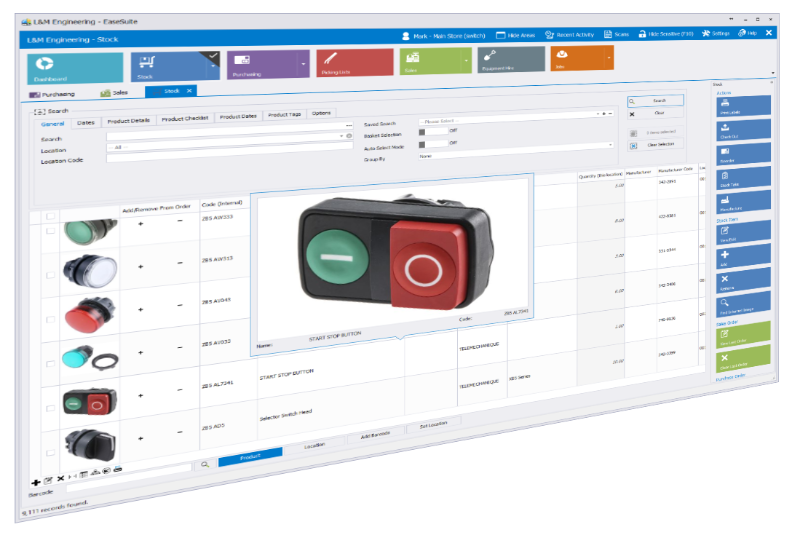 Associate photos, create hierarchical links to convey the asset relationships of complex equipment, identify problematic assets easily/gain justification for replacement, and more. At the heart of EaseSuite is the ability to switch items between staff members/departments and onto different work lists for progression until completion, with a history of activity. The software helps drive a proactive approach that ensures staff are kept busy and items are kept visible until fully dealt with. EaseSuite offers integration with numerous hardware and software. 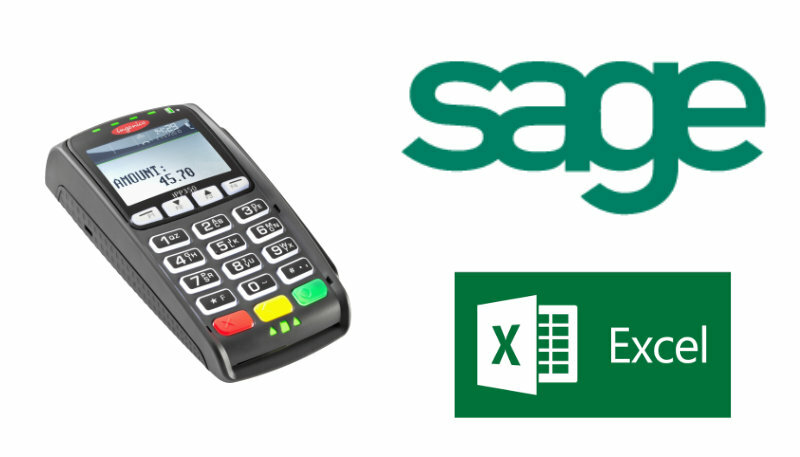 Sage Line 50 integration allows itemised purchase orders and sales invoices to be created in Sage in a single click. 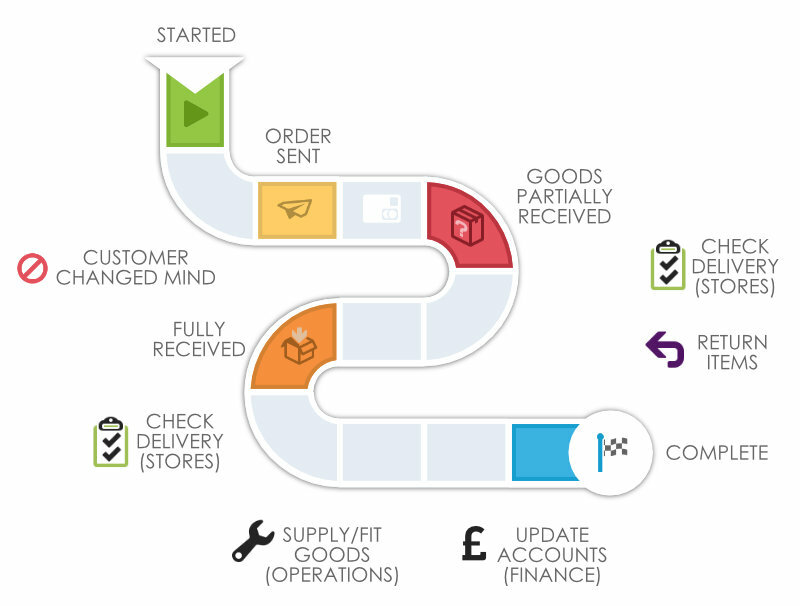 Customer and supplier records from Sage can also be synchronised into the system. The Excel import/export module allows lists of data to be brought in and out of the system from Excel, which can offer significant time savings when initially importing or bulk updating records. We also offer a customised import service to migrate data from an existing system into EaseSuite, tidying records & fixing duplicates along the way. Implementing this kind of system requires a good look at existing process and end objectives, inline with best practices. We offer consultancy to help businesses get the system implemented and achieve the most out of it, making in-house procedures more efficient along the way. After go-live, we offer 1st and 2nd line support services. 1st line support is our online support portal and offers quick response times to general queries plus a searchable archive. 2nd line support is when we need to visit or remotely connect to computers to assist. We're continuously improving the system with new features and areas based on customer feedback and ideas. Upgrades are conveniently delivered to customers through application self updating, which checks for new versions online. Over the course of a year we deliver many new exciting features regularly. Below illustrates some possible package editions available. Get in touch today to arrange a free demo!